The Krystal company is headquartered in Chattanooga, TN and was founded in 1932 (11 years after White Castle) and operates in Alabama, Florida, Georgia, Kentucky, Louisiana, Mississippi, South Carolina, and Tennessee (one store each in VA, NC, and AR). Maybe my version will be a new addition to their breakfast menu, but I doubt it. 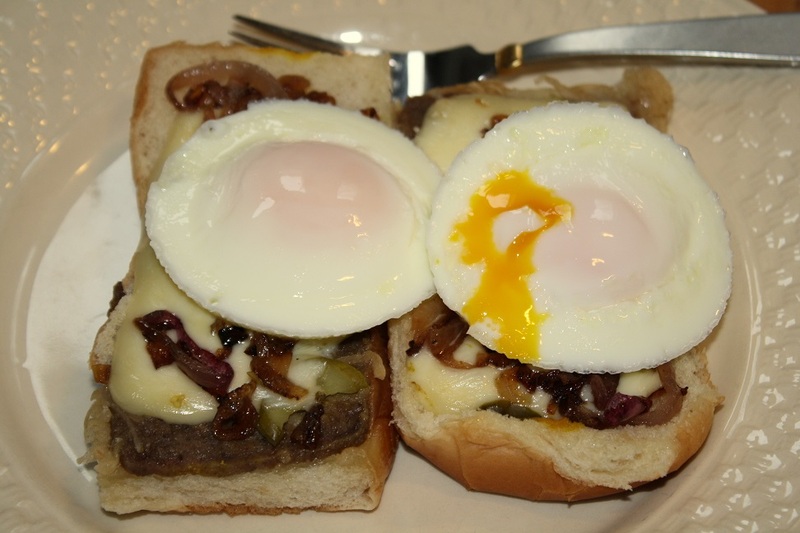 I began by poaching two eggs in cups and while they were cooking, I opened the burgers, topped each with a slice of pepper jack cheese, some sautéed onions leftover from the patty melts, and nuked for one minute. 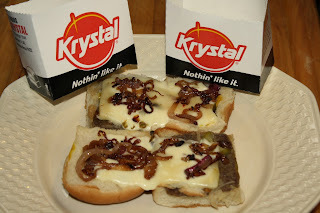 This was actually quite good and will be my new use for leftover Krystals – in case you’re wondering why we would have them leftover, it’s because Bev, just like her mom, can’t pass up a deal and usually buys the "Sackful" (12). But in her defense, they never go to waste. HAPPY EASTER and don't forget to consider Krystal for next year's menu :-). It’s funny what we sometimes build meals around and for this supper, it was rye bread. We still had some good rye bread from Pigeon Forge’s Old Mill Pottery House Café & Grille and Bev wanted to turn it into patty melts. 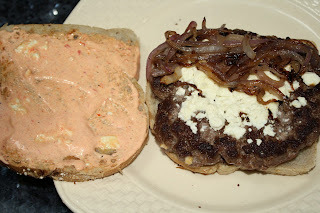 However, I’d recently saved and wanted to try the recipe for Feta Burgers with Roasted Red PepperAioli from Jenn’s Food Journey, so we decided to have both – we had everything on hand with a few minor ingredient changes (parentheses). 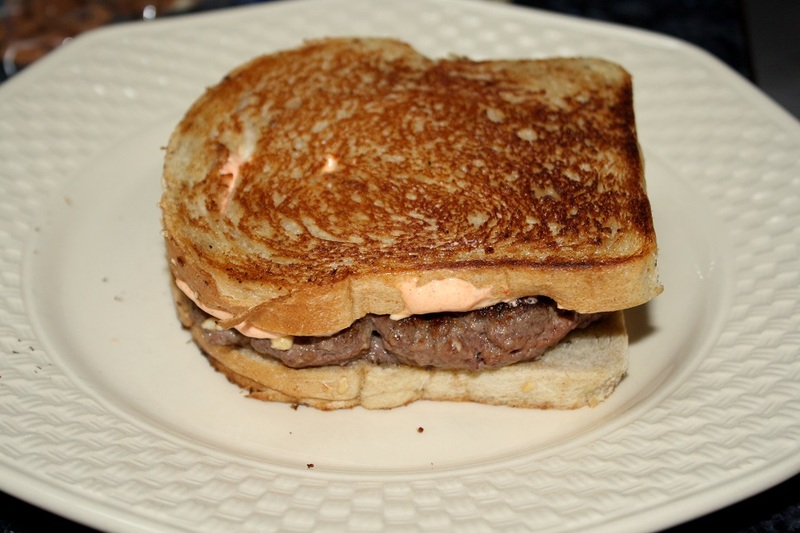 Please check out Jenn's fine blog (above link) for some great shots of her sandwich. 1. In a large bowl, add the ground beef, onion powder, garlic powder, 1 tablespoon feta cheese and pepper. Using your hands, mix everything together and form into patties (half pounders to cover the large bread slices). Cover and place in refrigerator until about 20 minutes before you are ready to cook them. 2. Add all the ingredients for the aioli into a food processor; pulse until everything is chopped and well mixed (we used a bowl and the immersion blender – much easier to clean up). Place in small bowl, cover and store in fridge. 3. Heat 1 tbsp. oil in a 12" cast-iron skillet over medium heat. Add the onions, season with salt and pepper, and cook, stirring occasionally, until softened and browned, about 10 minutes. Transfer the onions to a bowl and wipe out skillet if needed. 4. Working in batches, heat 1 tbsp. oil in skillet over med-high heat and add 2 burger patties; cook, flipping once, until well browned and at desired doneness - top with additional feta after flipping (I like feta and added a lot). 5. Transfer patties to a plate and keep in a 125* toaster oven while other patties cook. 6. 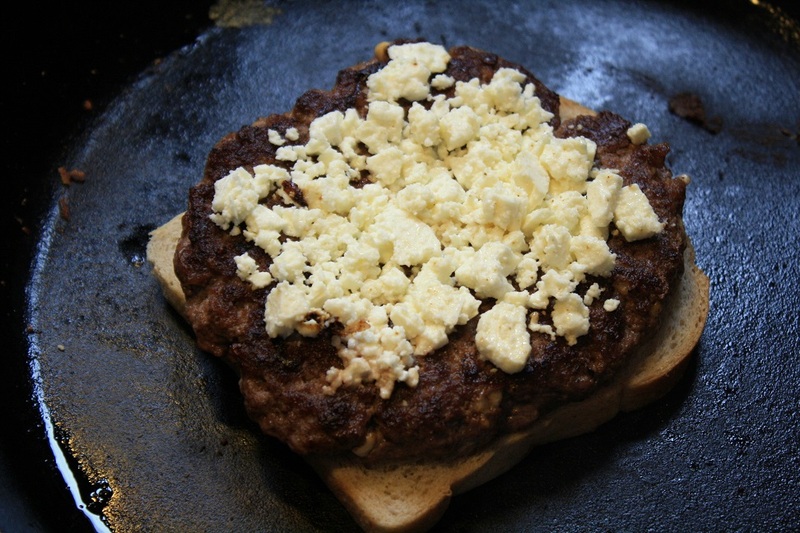 When all patties are cooked, wipe grease out the skillet and rewarm over medium heat. 7. Put the patties between two slices of rye bread, butter the top slice, and put this side down in the skillet – butter the top slice. When bottom is golden, flip and cook the other side to golden brown. 8. When done, remove from the pan, top with the aioli and onions (if desired), and enjoy. The classic patty melt includes sautéed onions but since I wasn’t sure how they would go with the other ingredients, I added them to only half my sandwich. Both halves were on the verge of roll-my eyes-back good and I liked the half with onions just a wee little bit better, as did Bev. This was truly a delicious meal and a nice adaptation of Jenn's dish - I can imagine many uses for the aioli.. 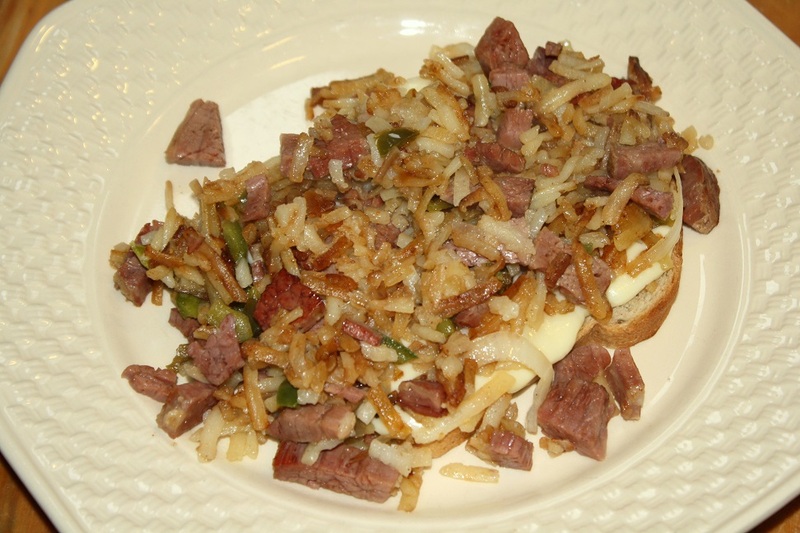 It took a while, but we finally got around to making some hash from the St. Patrick’s Day corned beef leftovers. Bev made the hash using frozen hash browns, onion, sweet pepper, and a little St. Maarten garlic hot sauce (her go-to sauce) by frying them in oil then adding the chopped corned beef toward the end. Most recipes chop the meat smaller add it earlier so it can develop a crust, but it also dries it out, so we prefer our method. I decided the eggs should be cooked in the poaching cups but one sank and I ended up with one true poached egg. It was a delicious and a great way to begin the day – Bev prefers lunch to breakfast fare and therefore ate a corned beef sandwich rather than hash. She made enough hash for two meals so the next day I had it again with a little twist. I started with a piece of good rye bread, topped it with Irish Cheddar and made cheese toast in the toaster oven. In the meantime, I nuked the hash to reheat it and poached a couple of eggs in cups. 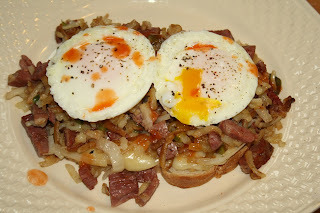 Assembly was cheese toast, hash, eggs, and a little more garlic hot sauce (Big Daddy Dave’s suggestion). Both meals were delicious as should be expected from semi-homemade hash and while I enjoyed them both, I think I preferred all of the flavors in the second one. 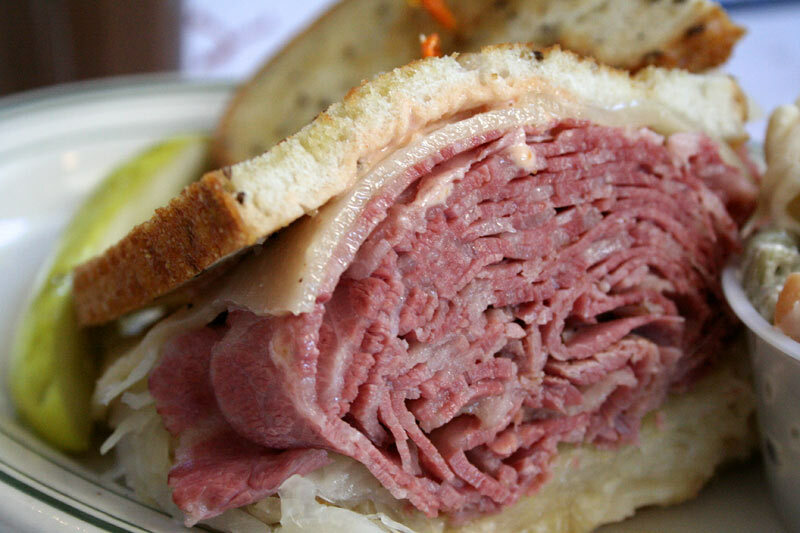 If I have enough corned beef for one more round, I may make this same dish but use 1000 Island dressing rather than hot sauce to make it more Reuben-ish. It’s Monday, March 25 and we’re getting light snow flurries as I type this. The predicted temps for today/tonight are 45*/30*, while last year (when summer came too early), it was 71*/49* and the average is 64*/41*. Personally I prefer 2013 rather than going directly from winter to summer temps like we did last year with very little spring, but I know many of you love summer. My favorite seasons in order are fall (the end of a long hot southern summer), spring (mild temps and nature putting on a show of color), winter (especially when we skied and I'm a kid at heart), summer (long, hot, dry days). I did a little veggie talk yesterday as part of a community program put on by the Master Gardeners in neighboring Roane County. The person before me spoke about composting which got me thinking about this bit of humor/truth and since I had it with me I had to read it to the group. I'd posted it here a couple of years ago but since I have new readers and it's that time of year, I decided to put it up again. This week’s BBQ cook did not include chicken but when my accountant friend, who does my taxes very reasonably and rarely orders BBQ, ask about chicken, I had to cook some for him. As a result, I had a couple of extra thighs and it occurred to me I’d never tried them with an egg, so a meal was born. topped them with a little pepper jack cheese, and nuked just enough to melt the cheese a little (didn’t want to cook the meat anymore). I topped it with the usual fried egg and enjoyed. After I had everything cooking, it occurred to me that poached eggs would have made for a better shot. The chicken had been cooked with Head Country Championship Seasoning and was very good and while the dish was good, it needed something, perhaps a little chopped onion and a very light coat of BBQ sauce to kick it up a notch. As I said on my St. Patrick’s Day post, it’s the things we make with the leftover corned beef that we really like and for supper on Monday, it was an almost-a-Reuban sandwich. 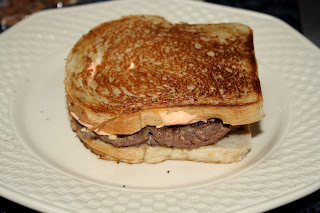 A Reuben is made from corned beef, Swiss cheese, kraut, and Russian dressing on rye bread and grilled but we had no Swiss cheese and opted for pepper jack instead and we used 1000 Island dressing, which is a normal substitution. preferring a thinner layer of meat spread evenly over the bread. I grilled it with just the meat and cheese so the cheese would have a better chance of melting, then added the kraut and dressing when it came out of the skillet. I’ve posted about Reuben's and corned beef sandwiches in the past but added this one because of the different cheese. The pepper jack provided a nice heat, which I really liked, and it may be the standard around here from now on, or maybe Swiss with a little crushed red pepper. I always thought it was English until the kids gave me a family crest indicating an Irish heritage, then some web sites I checked said it was both. I suppose it could have just come from anywhere where a lazy person got tagged with the name “do little”. I choose to think it’s at least a little bit Irish so I can legitimately participate in St. Patrick’s Day. In keeping with our any-excuse-for-a-party mentality, we invited a few friends over for a traditional meal of corned beef, cabbage, carrots and potatoes all cooked in the same pan. We found some Irish music on Direct TV and washed the food down with the traditional Guinness beer and green Marg O’Rita’s along with a green muscadine wine/champagne mixture. Most of us remembered to wear green – Bev didn’t and color blind Joe said he didn’t know if he was wearing green or not – note he isn’t in the shot :-). L-R: Friend Kathy, Joe and Carol's daughter Kortney, SIL Pat, Big Dude, and Carol. Before eating, we were entertained by the latest addition to the family - Madison's eight week old Maltese (no name yet). Like meatloaf, our favorite part of corned beef is the leftovers (hash, Reuben’s, etc) so Bev bought an 8# piece of meat that contained some of the well trimmed deckle (to make it that big) – I don’t recall ever seeing this brand before, it came from Costco. I covered the meat with water and one bottle of Guinness, added the spice pack, and cooked it slowly in the oven. When it was within an hour of being done, I added the veggies which dropped the temp so much, it took about 1½ hours at a higher oven temp to cook them. We added everything to a platter, but the Red Lobster cheese biscuits, and we all served ourselves. Prior to the main course, Bev served a spinach/strawberry salad using a recipe from Food.com. After we took this shot, neighbors Pat and Steve came in from a Cades Cove bike ride and joined us for dinner. Later in the evening, we had coconut cream pie from the Old Mill Pottery House Cafe & Grille in Pigeon Forge. We think the nearby Old Mill Restaurant is just so-so (tourists food) but we like the baked goods from the Pottery House (bread especially). The meal was a big hit and I would use the Mosey's brand of corned beef again. Tune in later for the left overs. My buddies Joe and Dave came down last week for another version of oysters-n-stuff and I won’t post again about the oysters as they were just our standard raw and Rockefeller. To go with these we had cold boiled shrimp, cooked a different way, flank steak, and roasted potato wedges. A couple of weeks ago, Mary from Barefeet In The Kitchen posted her recipe for The Best Shrimp Cocktail and I decided to try her unique (to me) cooking method which I’ve just adapted slightly from her site – check it out for the complete recipe including her spices and recipe for cocktail sauce. Mary used peeled shrimp but I cooked mine in the shell and used my own spices. In a large pot, combine the shrimp, 4 cups cold water, spices and cook this mixture over medium-high heat, stirring occasionally, until the water registers 170 degrees and the shrimp are just barely beginning to turn pink, about 5-7 minutes. Remove the pot from the heat and add 1/4 cup of fresh lemon juice, along with all of the lemon peels. Cover the pot and let the shrimp mixture rest until the shrimp are completely pink and firm, about 5-7 minutes. Dump into a colander to drain then add the shrimp to an ice bath to quick cool them. When cool, peel and store in the fridge until ready to serve. The method worked very well and the shrimp were just right except I made one screw up – I didn’t measure the 4 cups of water and used probably twice as much. As a result, it took longer to heat the water and the shrimp were turning pink at 150* so I just removed from the heat and followed the rest of the process – if you try this use 1 qt. of water and no more. For the flank steak, I marinated for 6 hours in The Best Steak Marinade In Existence and grilled over high heat to an internal temp. of 125* on the thick end. I show this photo to point out the difference between cooking like this vs. the reverse sear method which would have yielded much less of a well done section around the outside (but it does take longer to cook). The thin end was just right for those that preferred theirs medium. I didn’t get a shot of the potatoes but we used the recipe form Ina Garten for Baked Potato Wedges (with rosemary) and we thought they were very good. Another fun time and good eats at Almost Heaven South. Bev had bought some Pasta Prima Lobster Ravioli from Costo and for sauce she added some heavy cream to a tomato sauce she had made earlier for pepperoni rolls. It made a very good sauce for the ravioli, which we also thought were pretty good for out-of-the-package (we'll wait for lobster ravioli connoisseur and friend Laurie to try them and let us know for sure) . Since Bev had sauce left over, she decided to make a breakfast pizza utilizing some pre-made Mama Mary’s crusts, also from Costo. For the pizza, she brushed the crust with olive oil and added a shredded Queso Blanco (only white cheese we had), then she added the sauce and toppings of crumbled crispy bacon, sautéed asparagus & onion, soft scrambled eggs, and raw eggs in pockets. She baked it about 15 minutes then added some more of the cheese and baked until it melted - chopped green onions added prior to serving. The pizza was very good and the sauce worked well for it. The only thing that would be different next time is to bake the crust cheese and sauce a little first then add the other ingredients (warm) so the raw eggs are only the oven a few minutes to maintain the runny yolk that I like (these were hard) – or just add the eggs already fried at the end - or use all scrambled (easiest). Header - Coco was originally Madison’s dog and she still is drawn to her. Here she is helping Madison take a nap and her head was down on Madison’s until we decided to take the shot. I didn’t believe it until I tried it. Below is an email that's going around and maybe it's been circulating for years, but I received it for the first time yesterday, as usual. It makes a claim that seems dubious at first and you may have already seen it, but if not, please take two seconds to give it a try. It worked for both Bev and I and you don't have to be sitting at your desk. "This is so funny that it will boggle your mind. And you will keep trying it at least 50 more times to see if you can outsmart your foot. But you can't!!! I told you so... And there is nothing you can do about it." During the winter of 2011-2012 a tree fell thru the ramp leading down to the dock and after removing the damaged area, it looked like this. My buddy Joe and I then replaced this section with the full intention of replacing all of the deck boards and railings. After a year of no activity, I realized I’d rather take a beatin than do this job, so I hired my builder neighbor to do it and in 4 days it looked like this. Nothing like having a carpenter who really knows what he’s doing to turn a sows ear into a silk purse by cleaning up the lines and making it worthy of the dock it leads to. It's ready for this year's blogger party and I now need to check and see if there are any more trees at risk of hitting the ramp and, if so, try to deal with them proactively. After 5" of rain, the lake was up and very muddy . Bev used one of her Groupon’s to buy a good sized grouper filet and I went to my blog recipe file to find something different. We settled on the recipe for Seared Halibut with Garden Tomato-CaperSauce from Susan over at Savoring Time In The Kitchen. I adapted it just a little for our taste and to use ingredients we had on hand – my changes are in (). 1. Heat the olive oil in a large, heavy skillet over medium heat, add the onion and cook, stirring often, until tender, three to five minute. 2. Add the garlic and the capers and cook, stirring, for three to five minutes, until the onion has softened thoroughly and the mixture is fragrant. 3. Add the tomatoes, salt, pepper, thyme, and basil, bring to a simmer and cook, stirring often, for 15 to 20 minutes, until the sauce is thick and fragrant. Taste and adjust seasonings. 4. (I tilted the skillet to make a pool on one side, then used an immersion blender to break up the chunks of tomato and make a smoother sauce). 5. Add about 1/4 cup of cream and stir. Cover and keep warm while the fish cooks. 1. Pat fish dry with paper towel, season with salt and pepper, and dust lightly with flour. 2. Use the beaded water test to heat a 12” stainless pan to the proper temperature and add the oil. 3. Sear fish on side one until a golden color is achieved then flip and cook to an internal temperature of 135-140*. For those that get done early, keep warm in a 140* toaster oven. 4. Place a large spoonful of the tomato caper sauce on each plate, and place a piece of fish on top. If desired, top the fish with another spoonful of sauce and garnish with fresh basil or thyme (I obviously didn’t do either, so please check Susan’s shots for a much prettier presentation). Thanks Susan for a very good meal and Bev plans to use the extra sauce on meatloaf. Feel free to substitute the word America for Egypt. I had requests for a look at the RV inside and here is a link to the standard one - ours is just the same with a little lighter wood - http://www.youtube.com/watch?v=GLLqqc01mw0. You can skip the first 1:07 of advertising. We had the first trip in our new RV (shake-down cruise) planned to begin this past Saturday and had selected Charleston, SC as the location. We picked Charleston because of the likelihood of warm weather, we wanted to explore the city and, as a bonus, the best man in my first wedding (I’ve only had two) lives there. As it turned out Mother Nature had a different plan. We would have been driving I-40 through the NC mountains where snow was predicted for Friday and Saturday and even if the roads got cleared, we didn’t want to yuck up the clean coach. We might have delayed a few days, but the Charleston weather forecast was highs in the 50’s and low’s in the 30’s (same as here) and rain half of the time – not too good for the outdoor stuff we wanted to do. We got a larger coach as we now have Madison and Bev’s sister wants to travel with us – the old coach was just too small for four humans and three dogs. With slide-outs on both sides and a bath and a half, the Tuscany provides much more living space than the Holiday Rambler with just one slide and a small bathroom. So, rather than a shot of our first campsite, here is the new ride sitting in the driveway with the old one. Our driveway looks a little like a campground but the old one will be moved since we got everything out of it. I plan to sell it myself as the dealer wouldn’t give me what I wanted for it. Since we still want to make the shake-down trip prior to setting out on a longer one, we’ll look around for some place nearby to visit when the weather permits. I’ve said this several times but a good hamburger may well be Bev’s favorite food. And she likes them loaded up with stuff plus a reasonably thick burger – not like the meatballs you see served by restaurants on TV though. The problem has always been finding a bun that will stand up to the eating process and not fall apart or turn to mush. Recently she and the SIL had their first burger at Fuddruckers and Bev said that not only was it a good burger but the bun held up. As it turns out, their philosophy is “You don't put the World's Greatest Hamburger on the World's second greatest bun. Not if you want to remain the World's Greatest Hamburger™,” so they make their own buns and sell them separately. Bev brought home a bag to see how they would do with one of her burgers. She started with burgers that looked like they had to be at least half-pounders and after I grill them, the construction process began and included the cheese added while grilling, lettuce, onion, tomatoes (the good ones), jalapeno slices, mustard, mayo, and pickle slices (I had mine on the side to cut down on the height). This is mine and I neatened it up a little prior to attacking it - I wish I'd measured it's height. As you can see, the bun itself is pretty thick and not for those who are on a low-carb diet and to give it a good test, it wasn’t given the extra strength of toasting. Neither the bun crust or inside were as soft as the typical store bought buns, which seem to just be regular bread dough baked in a different shape, but both were plenty soft enough. I can’t say if it was the buns thickness, the dough they used, their baking process, or all of them, but the bun lasted until the very end, even though it had to be mauled to get my mouth around it. These have just become our go-to burger buns. A tip we learned a long time ago – never put the tomato against the bun as it will soak and weaken it, as will anything wet – ours always gets dry lettuce as the top layer and it's probably best to put the cheese against the bottom half or another piece of lettuce as a juicy burger will also do it in.